My research findings, published in the latest issue of the U.S. Naval War College Review, question whether the Indian military’s current operational concepts are sufficiently tailored to the nature of the terrain and the evolving China challenge. I suggest a more proactive Indian approach to territorial defense that would place a greater emphasis on the integration of forward-deployed, highly mobile teams of Indian special operations forces, coupled with advanced intelligence, surveillance, and reconnaissance (ISR) and precision strike capabilities. These efforts would be complemented by a more extensive network of tribal scouts and militias. I do not argue that large-scale conventional forces have no role to play in the event of a Sino-Indian border contingency or that India should rely exclusively on special operations for conventional deterrence along the border. Rather, my emphasis is on developing a better complementarity between general purpose and special forces. Indeed, it has been repeatedly demonstrated that modern militaries are at their most effective when they succeed in integrating conventional and special operations within a common, clearly defined, strategic framework. There are certain enduring misperceptions regarding the military balance along the Sino-Indian border. The most common is that China’s localized military strength along the LAC far outweighs India’s. In reality, India possesses a clear advantage in terms of sheer numbers of troops. With regard to airpower, New Delhi also possesses something of an edge, even though this may be rapidly eroding — in large part due to the continued hemorrhaging of India’s fighter fleet and the growing density and sophistication of China’s integrated air defense (IADS) network in the Tibetan Autonomous Region (TAR). The vulnerability of India’s air basing infrastructure to artillery and missile strikes is another concern. When it comes to mobile and lightweight artillery — perhaps one of the most critical factors given the nature of the terrain — China holds the upper hand, in large part due to India’s unending procurement woes in this domain. The difference in-between both countries’ territorial defense postures. Whereas India maintains a large (and growing) body of troops relatively close to the border, China’s military presence in the TAR is more limited. In accordance with its doctrine on frontier defense, China stations most of its conventional forces in its interior, to be surged in times of crisis. This posture has been facilitated by the impressive development of China’s highway and high-speed railway networks. These logistical feats have not been lost on Indian planners, who estimate that Beijing could dispatch several divisions to the LAC within a few days. The nature of the climate and terrain. There are substantial topographical variances in-between various portions of the LAC. Few areas along the Indian side of the LAC are amenable to mechanized warfare, excepting certain parts of Ladakh and Northern Sikkim. Due to the high elevations of the Tibetan plateau, Chinese ground forces benefit from certain commanding advantages. Also, Chinese forces will be better physically acclimatized to high altitudes in the opening phase of a war. On the other hand, the elevations of the Tibetan plateau make high-tempo air campaigns more difficult. At very high altitudes, jet engines take longer to ignite due to lower air density and fighter aircraft are constrained in terms of their overall payload capacity. More generally, the weather can have an inordinate impact on the planning and conducting of military operations, as in mountainous environments meteorological conditions are highly unpredictable and can undergo drastic shifts within a few hours. Extreme cold, altitude, and weather affect almost every element of military equipment, ranging from cannons to helicopter rotors and artillery operations. During the harsh winters, certain mountain passes can be temporarily inaccessible, while other regions (such as Aksai Chin) can counter-intuitively be rendered more passable for heavy vehicles due to the presence of a thicker layer of frost and ice. In the northeastern state of Arunachal Pradesh, some of the world’s heaviest rainfall regularly cause landslides, disrupting motorized traffic and troop movements. The infrastructural disparity along both sides of the LAC. Whereas Chinese troops can gain rapid access to most areas along the LAC, Indian troops often have to trek several hours if not days to attain certain areas. The People’s Liberation Army (PLA) also benefits from a much more robust, multilayered communications architecture. The very different command structures along the border. Whereas in India the responsibility for the defense of the LAC is divided in-between several regional army and air force commands, in February 2016, China announced a major military re-zoning, folding the former Chengdu and Lanzhou military regions into one unified Western theater command. This will have an impact on China’s military effectiveness in the event of conflict, allowing for greater unity of effort. Sino-Indian Border Deployments (Units located via IHS Jane’s Database August 2016. Does not include paramilitary units, People’s Armed Police (PAP), or infrastructure still under construction). Graphical construction superimposed on Google Maps. India’s material response to China’s intensified military coercion has been twofold. First, it has decided to sizably augment its force structure, via the raising of the new Mountain Strike Corps and battalions of scouts, and by stationing additional air, missile, and surveillance assets. Second, it has sought to remedy one of its key defensive shortcomings — the paucity of rail and road infrastructure in certain key border regions. For the past few years, a bevy of large-scale border infrastructure projects were launched, albeit with mixed results. While some progress has been made in certain areas, most of India’s road and rail construction projects have fallen victim to considerable delays. Once the Chinese seize a position, it may be very difficult to dislodge them. Rather than expend much blood and treasure attempting to storm impregnable positions, we should pursue a strategy of horizontal escalation and capture territory elsewhere. Ladakh and Northern Sikkim are both considered good locations for mounting such a mechanized riposte. Indeed, they provide some of the few staging areas along the Indian side of the LAC conducive to mechanized warfare and overlook main axes of approach (the plateau of Aksai Chin and the Sora Funnel) and logistical lifelines, such as the China Western Highway. In the event of conflict, India’s mechanized forces would sweep down from these mountain plains in order to conduct pincer movements behind advancing Chinese formations, with the hope of breaking the enemy’s troop concentration. India’s mechanized counter-offensive would only form one component of a wider theater strategy, however. In addition to these movements, Indian air and missile power would be brought to bear on transport and communication nodes deep within the Tibetan Autonomous Region, with the goal of delaying or preventing the arrival of PLA reinforcements. Despite this shift towards a more offensive form of area denial, India’s current approach to conventional deterrence along the LAC continues to present certain limitations. Indeed, while New Delhi’s overarching military strategy has evolved — most notably by more vigorously stressing the need for cross-border strikes — the force structure changes it pursues today are remarkably similar to those enacted in the wake of the 1962 war — a massive accretion in conventional landpower. New Delhi also continues to rely on geographically dispersed conventional units or on poorly equipped paramilitary forces — in the form of the Indo-Tibetan Border Police (ITBP) — as India’s first line of defense in many of the forward areas that are most vulnerable to Chinese aggression. The rugged nature of the topography, along with the continued paucity of the infrastructure, means that even though India forward-deploys a large number of conventional “screening forces” along some of the most obvious axes of approach, these troops are relatively static and could potentially be outflanked by small detachments engaging in rapid lateral movements. Meanwhile, a large portion of mechanized army units will still be stationed in the lowlands, with the expectation that they would be rushed to higher altitudes in the event of conflict. Not only would this be logistically challenging due to the enduring deficits of India’s road and rail infrastructure, it would also prove physically taxing. Indeed, in contrast to the first wave of PLA troops flowing from the heights of the Tibetan plateau, Indian troops deployed from interior garrisons would be surged into combat before having been properly acclimatized. This would naturally also be the case for PLA reinforcements surged via high-speed rail. However, and in contrast to India, China has built a number of oxygen-rich, hyperbaric chambers in order to more rapidly acclimatize its follow-on forces. Secondly, this manpower-centered approach to deterrence has already proven to be prohibitively costly and will only become more so. Indeed, India’s expansion of its ground forces has been accompanied by a rise in personnel costs, a trend that is slated to exponentially increase over time. Finally, the natural compartmentalization of much of the terrain — which often does not allow the effective maneuver of large units — impedes the massing of force, especially when moving uphill. As India’s conventional forces wind their way up narrow mountain roads to higher elevations or are funneled through mountain valleys, they could find themselves targeted by Chinese artillery barrages and missile strikes, suffering disproportionate numbers of casualties. India possesses a large number and variety of elite units. Some of these belong to the Home Ministry, such as the National Security Guards (NSG), which focuses almost exclusively on counter-terrorism operations, while others fall under the tutelage of the Ministry of Defense. To add to the confusion, some units occasionally qualified as special operations forces in India, such as the Army Ghatak platoons, are not really special operations forces as the term is commonly understood. For the purposes of this discussion, I focused primarily on the units most likely to play a role in the event of a Sino-Indian border conflict — the special operations forces-qualified elements of the army’s Para Commando battalions and, to a lesser extent, the Indian Air Force’s relatively newly formed Garud unit. At the time of writing, the Army possessed eight battalions of special operators, with plans for future expansion, as well as five battalions (or a brigade) of airborne paratroopers. Each battalion is nominally pegged at approximately 700 men, but many units are reportedly undermanned, underequipped, and suffering from a 30 percent officer shortfall. The Garud, which were formed in 2003, currently comprise about 1000 troops. Their numbers were slated to double in reaction to the attacks on Pathankot airbase in early 2016. While the Navy’s special operations component — the Marine Commando Force (MARCOS) — has been stationed in small numbers at certain high-altitude lakes in Jammu and Kashmir, their role in a border conflict with China would be minimal at best. The fabled Special Frontier Force (SFF) could also play an important role. Formed following the Sino-Indian War in late 1962, the SFF is part of India’s external intelligence agency, the Research and Analysis Wing (RAW), and answers directly to the cabinet secretariat. Modeled on the Kennedy-era U.S. Special Forces, it is rumored to contain about 10,000 soldiers trained to conduct operations behind enemy lines and engage in special warfare. The roles of these units can be examined along three axes: their utility to counter gray zone aggression, their aptitude to engage in direct action behind enemy lines, and their ability to conduct special warfare in the Tibetan Autonomous Region. Certain aspects of gray zone campaigns, such as the utilization of proxies, have long been familiar to Indian security managers, who have had to contend with such modes of Pakistani covert action since independence. China’s historic use of infrastructure development as a means of (literally) cementing its claim over contested territory is also well known in New Delhi. After all, many past episodes of border tension have occurred following Indian forces’ belated discovery of Chinese road and basing development in remote border areas. Within U.S. strategic circles, it is perhaps the special operations community that has thought the most about how to effectively counter such forms of territorial encroachment. Indeed, special operations forces provide democratic policymakers with the capacity to respond rapidly, effectively, and in a tailored manner to such acts of infiltration, subversion, or sabotage. In India’s case, a wide variety of scenarios were mentioned in the course of private conversations, such as Chinese clandestine operatives or special operations forces entering Arunachal Pradesh or Sikkim disguised as Tibetan refugees, nomadic herdsmen, or economic migrants from India’s troubled northeastern territories. Indian military officers also expressed concern over their past inability to detect Chinese infrastructure development in a timely fashion and mentioned the possibility of Chinese engineers discreetly constructing small landing grounds, hidden ammunition depots, and surface-to-air missile (SAM) sites during the “off-season,” when Indian soldiers no longer can gain access to certain areas close to Chinese positions due to the snow and paucity of infrastructure on the Indian side of the LAC. In order to respond with alacrity to such scenarios, Indian special operations forces would need, first and foremost, to be able to detect them. India’s advances in space-based surveillance, along with the planned induction of a large number of surveillance platforms — in the form of high-altitude unmanned aerial vehicles (UAVs) and aerostats — promise to prove helpful in this regard, but the difficult nature of the terrain induces a certain amount of limitations. While India has been contemplating Israeli-type security systems along certain portions of its border with Pakistan — complete with night-observation cameras, long-range detection radars, motion sensors, and thermal imaging — the deep valleys and craggy peaks which prevail across much of the LAC preclude such ambitious technological solutions, not to mention that it would prove prohibitively expensive. Radio, radar, and even satellite communications systems have difficulties operating around terrain folds, and the very fact that the Sino-Indian border has not been officially delineated means that any large-scale Indian fencing effort would be viewed by China as a severe provocation. As a result, human intelligence (HUMINT) would prove absolutely critical in detecting Chinese gray zone operations. For decades, Indian intelligence services have depended on the knowledge gleaned from nomadic herders, who frequently wander in-between Indian and Chinese-controlled territory along the LAC. Religious pilgrims and resident tribal populations provide other invaluable sources of information. India should seek to further sharpen its HUMINT capabilities along the LAC by focusing on training more of its intelligence officers and special operations forces in the languages and dialects of the many peoples along the border. New Delhi should also fast-track the much delayed Border Area Development Program (BADP), with a particular focus on the regions must likely to be the targets of future Chinese incursions (Arunachal Pradesh and Ladakh). Finally, the addition of more tribal and local forces — in the vein of the Ladakh Snow Tigers or recently raised Scout battalions from Sikkim and Arunachal — would considerably buttress India’s conventional deterrent in its border regions. Not only does this constitute a low-cost approach to frontier policing, it also provides Indian security managers with a year-round, forward-deployed, “tripwire” force that is physiologically acclimatized to high altitudes and mountain warfare and has an innate knowledge of the terrain and local conditions. Small teams of Indian Special Forces — in the form of joint terminal attack controllers (JTACs) or communications experts — could be attached to each battalion, much in the way the United States embedded small teams of SOF amongst its Northern Alliance partners during Operation Enduring Freedom. Equipping select teams of Sikkim and Arunachal Scouts with anti-tank guided missiles (ATGMs), light mortars, and shoulder-mounted rocket launchers could also prove judicious. Indeed, the goal should not only be to provide the Indian Army with lightly armed reconnaissance units, but also with hybridized structures that can help mount a Fabian defense of their respective home states in the event of a larger-scale Chinese incursion-delaying, harassing, and attriting PLA forces. India, albeit somewhat more belatedly than China, has begun to attach more importance to airborne assault operations, including their utility in targeting Chinese transport and communication infrastructure in the Tibetan Autonomous Region in the event of conflict. There is also a growing realization amongst certain military thinkers that Indian special operations forces could be called upon to play a critical role behind enemy lines, conducting sabotage, reconnaissance, and direct action operations. 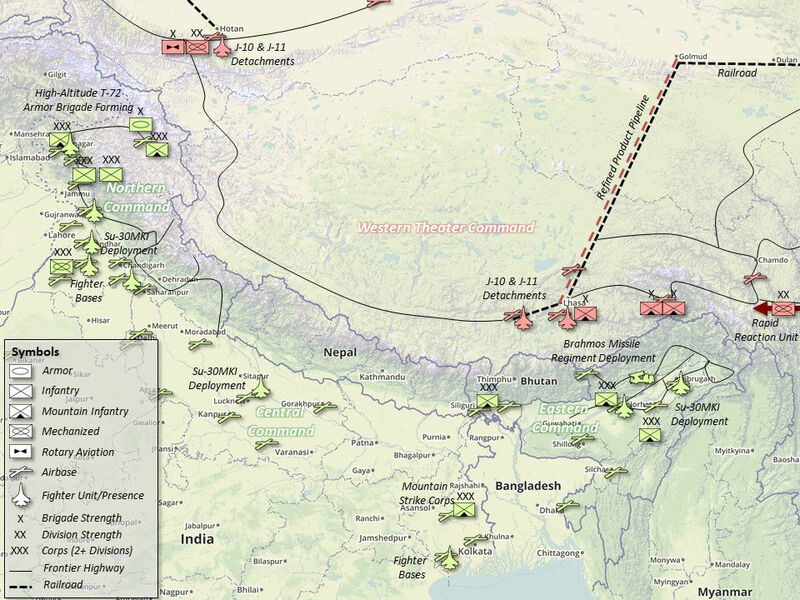 Indian military planners recognize that the combat environment straddling the Sino-Indian border may progressively morph into something of a no-man’s land for large clusters of ground forces and high-signature platforms due to the growing ubiquity of extended-range, precision-guided munitions. Indian advanced landing grounds and airbases are increasingly vulnerable to missile and artillery bombardment, and the government has yet to finalize the construction of hardened shelters for the Indian Air Force’s best squadrons of aircraft. While Indian fighter pilots have begun to train using sections of road and highway as dispersal runways, there are a number of other passive defenses which could still be implemented, such as investing in large numbers of subterranean shelters with stockpiles of munitions, lubricants, and petroleum. Absent such efforts, Indian airpower near the border could be effectively crippled in the first phases of conflict or suffer from virtual attrition, devoting the bulk of their sorties to defensive counter-air or SEAD (suppression of enemy air defenses) missions rather than conducting precision strikes against enemy airbases and ground targets. This role, noted some Indian military officials, may need to be entrusted to small demolition teams of special operations forces, which could carve “holes” in China’s reconnaissance strike complex and potentially provide terminal guidance for standoff missile strikes conducted from outside the range of China’s air defense networks. This “penetrating role” is in line with the conceptualization by some U.S. analysts of special operations as low-signature entry forces within heavily denied or contested environments. The challenge, however, would be to successfully insert special operations guidance and demolition teams in the absence of dedicated, stealthy airlifters. Advances in air defense systems and long-range surface to surface fires have raised new questions about how to conduct airborne operations without incurring large-scale, potentially catastrophic losses. Large, high-signature transport aircraft would be vulnerable to Chinese radar-guided SAMs — providing the latter had not already been suppressed prior to the air assault. More discreet modes of airborne insertion, i.e. via low flying heliborne strike forces, could still be put at risk by lower-altitude air defense systems and anti-aircraft guns. Indian troops would most likely need to establish drop zones at a distance from the densest thickets of Chinese low-altitude systems, rely on airborne light armored vehicles in order to gain greater mobility and firepower, and compensate for the distances separating their lodgments from their target points. Once successfully inserted, Indian special operations teams may need to operate “blind” within an information-denied environment, particularly if India’s fragile space-based communications architecture has been preemptively degraded or disabled. Longer-range, high-altitude UAVs, when combined with a more robust satellite and airborne communications network, could improve the Indian Army’s ability to locate and direct fire at enemy targets situated at a greater distance, as well as preserve communications amongst dispersed units. Following India’s defeat in 1962, Nehru made the fateful decision — long encouraged by some of his intelligence czars — to covertly aid and abet insurgency movements within Tibet and to arm India’s sizable Tibetan refugee community. A secretive force was thus established — the SFF. Composed of thousands of ethnic Tibetans, many of whom had been former resistance fighters in the TAR or part of the Dalai Lama’s bodyguard, the SFF was an elite unit of paratroopers, trained in mountain warfare, sabotage, and demolition. The CIA played an important role shaping the SFF’s development in its early years, providing training and instruction in guerrilla warfare tactics. Doctrinally, the unit is heavily inspired by Kennedy-era U.S. Army Special Forces, with their predilection for special warfare and operations deep behind enemy lines. Since its creation, the SFF has played an active role in India’s regional conflicts, fighting behind enemy lines in Bangladesh alongside Indian-sponsored militias — the Mukti Bahini — in the war of 1971, detonating bridges and suffering, according to some accounts, dozens of casualties. Unconfirmed reports have also indicated that the SFF played a role in the Indian military assault against the Golden Temple, Operation Bluestar in 1984, and in the Kargil War. The current state of the SFF is difficult to ascertain. The unit continues to exist and to be based in the hill town of Chakrata, in the state of Uttarakhand. Details pertaining to its force structure, equipment, and operational mandate in the event of a Sino-Indian confrontation are considered extraordinarily sensitive. The main question relates to the contemporary role of what some have referred to as India’s “secret Tibetan army.” Ever since the late 1970s, and the tentative beginnings of Sino-Indian rapprochement, a tacit arrangement — or quid pro quo — has been observed. China agreed to end its support for insurgent groups in India’s troubled northeast, whereas India subscribed to a One China Policy and officially abandoned its clandestine efforts across the Tibetan border. The reality is somewhat more complex. Although China no longer directly supports militancy in places such as Nagaland, Mizoram, and Assam, Chinese middlemen have been known to funnel weaponry via countries in Southeast Asia. Meanwhile, other countries, such as Pakistan, continue to play an active role in the area, raising questions over whether China chooses to maintain close ties with certain of these groups via a third party. When it comes to India and Tibet, there is a similar sense that New Delhi could, potentially, revert to older policies if it found itself so compelled. One might question, however, whether the SFF would be able to successfully prosecute a special warfare campaign in today’s environment. First of all, such an effort would most probably be far more isolated than if it had occurred during the early to mid-1960s, when the SFF was established. In the event of another conflict, India might essentially find itself conducting the bulk of its covert campaigns alone. Even if the SFF task forces are successfully inserted, it might prove extremely challenging to sustain them, given the contested nature of the aerial environment over the Tibetan Plateau. Another key difference lies in the extent of China’s surveillance and control over Tibet, which is far greater than in 1962. Since the 2008 disturbances, in particular, Beijing has vastly improved its internal security apparatus in the Tibetan Autonomous Region. People’s Armed Police (PAP) forces, often formed of recently decommissioned PLA troops, have grown ever more numerous in Tibet, and increasingly militarized — equipped with heliborne rapid reaction units and armored vehicles. Their presence, in addition to the not unsubstantial PLA element already stationed in the TAR, could present a formidable challenge to Indian special warfare efforts. Moreover, it remains unclear whether the majority of the younger generation of Tibetans living on the Indian side of the border would be as willing to take up arms alongside their brethren as some have claimed. Finally, India’s political leaders might be reticent to deploy the SFF in such a role, either because they view it as being too escalatory or because it would lead to further protraction thus impeding war termination. The first, most immediate set of hurdles resides in the technical and operational domain. Indeed, numerous observers, both within and outside India’s special operations community, have drawn attention to chronic shortfalls in essential equipment, such as parachutes, night vision devices, communications devices, laser designators, and high-altitude clothing. Another common complaint was that the SOF had expanded too rapidly in size and in ad-hoc manner, without the benefit of careful, deliberate planning. This overly rapid expansion has exposed certain deficiencies in India’s SOF training infrastructure. In 2010, special operations officers had already warned that it would take “many years” for the Indian Army Special Forces Training School (SFTS), in Nahan, 300 kilometers north of Delhi, to catch up with the expanded force’s new requirements. Foreign observers noted that the SFTS still lacked key facilities, such as vertical wind tunnels, next generation simulators, and additional firing ranges. Additional issues are officer manpower and declining retention rates. It is estimated that most paratrooper special forces units suffer from an officer shortfall of approximately 25 to 30 percent. As one brigadier general stationed at Army Headquarters noted, a growing number of Indian special operations officers are leaving the service in order to pursue more lucrative careers in the private sector. Perhaps the greatest set of challenges lies in the organizational domain. Indeed, absent a restructuring of India’s special operations capability around a Joint Special Operations Command (JSOC), many of the more chronic problems affecting training, procurement, and information sharing will most likely endure. The existence of a JSOC would also bring about greater strategic and doctrinal clarity, along with more institutionalized joint training. For the time being, India’s paratroopers have no organic air wing, and the Indian Army’s air arm does not yet possess its own ground attack capability. (The Indian Air Force has retained control over newly acquired heliborne platforms critical for special operations and airborne assault, such as the Apaches and Chinooks purchased from the United States, although this is projected to change in the near future.) With each service striving to create its own special operations unit, there has been a certain amount of duplication in terms of core competencies. There has been little profound reflection on what some of these newly formed units could bring in terms of added value — and this despite the existence since 2008 of a (classified) Indian Joint Doctrine for Special Operations. The IAF’s Garud, for example, have yet to truly evolve beyond their primary objective of protecting airbases and installations — a task which could no doubt be relegated to a force already designed for such a purpose — the paramilitary Central Industrial Security Force (CISF). There is a broad consensus within India’s special operations community that the Garud truly need to focus their efforts on developing a core of highly trained JTACS and forward-deployed air combat control teams. Another core objective would be to specialize in the emergency extraction of downed IAF pilots or groups of SFF or paratroopers isolated behind enemy lines. Yet according to what I found in my research, not much progress has been made on these fronts until now. When Prime Minister Modi came into office, there was hope in some quarters that some long advocated defense reforms — such as the creation of a Chief of Defense Staff, Aerospace Command, Cyber Command, and JSOC—would finally materialize. As time has gone by, hopes of sudden and major reform under this government — whether in the realms of economy or defense — have begun to dwindle. Some Indian interviewees noted, rather pessimistically, that major organizational reform might only occur in the wake of some form of catastrophe. This was the case, for example, for the United States, which created Special Operations Command in the wake of the humiliating debacle of Operation Eagle Claw. In his detailed empirical study of the efficacy of past special operations, Colin Gray points to the fundamental importance of “permissive domestic conditions, and a tolerant political and strategic culture.” Due to the unorthodox nature of their tactics and the politically sensitive missions with which special operations forces are often entrusted, their use implies a certain risk tolerance on the part of political decision-makers. In 2015, the Indian government signed off on a much publicized and relatively successful paratrooper raid into Myanmar. The operation, however, was undertaken against lightly armed insurgents and with the acquiescence of the host government. Most recently, Indian Army special operators allegedly carried out punitive strikes against “terror launchpads” in Pakistan-occupied Kashmir, in response to a bloody terrorist attack on Indian soil. Deploying Indian forces for more prolonged missions, deeper into contested territory, and against a far more capable adversary would require a much greater willingness to embrace risk, friction, and uncertainty. On a broader level, successful covert action hinges upon a clear intellectual understanding of the strategic value of special operations, rather than a fixation on short-term tactical gains. Within the Indian media, commentary on SOF-related issues is all too often narrowly confined to counter-terrorism. Meanwhile, a common refrain among Indian paratrooperofficers was that India’s political leaders and public view special operations forces as “little more than glorified infantry.” While there is certainly a danger in overly fetishizing special operations forces and in neglecting to properly integrate them with conventional forces, there are also costs to failing to appreciate the uniqueness of their attributes. Well-known South Asian scholars have described India’s military strategy as being one of restraint and as suffering from an absence of strategic initiative. While there may be some truth to these characterizations, they are also, in the opinion of this author, too sweeping. Indeed, India’s very unique model of civil-military dysfunction has, somewhat paradoxically, provided the armed services with a lot of leeway in the pursuit of operational planning. The Indian Army’s concept of operations for an LAC-related contingency is also far from status quo-ist or reactive. To the contrary, it places a strong emphasis on rapidly regaining the initiative, on conducting surgical strikes deep within the Chinese interior, and on horizontal escalation across multiple different sections of the border. The question, however, is whether India’s political leadership would be willing to sign off on these plans. Even though India’s current government seems intent on signaling that it is less reticent to risk escalation and use force, much would depend on the circumstances of the conflict and the exact nature of Chinese aggression. Perhaps most importantly, would India’s political leadership draw on its Tibet “trump card” and exercise the special warfare option? New Delhi may be leery to do so for several reasons. First, it may fear a Chinese counter-escalation in India’s northeast, with all the attendant implications for India’s long-term stability and ability to secure the narrow Siliguri corridor, which connects its northeastern states to the Indian subcontinent. Second, such a move could encounter hostility from the current Tibetan government in exile, which has officially renounced violence and has historically perceived Tibetan guerrilla movements as competing power structures amidst a heavily factionalized refugee community. Finally, Indian security managers may be unwilling to stoke the flames of militancy for fear of inadvertently redirecting Tibetan nationalism and spawning yet another form of insurgency or ethnic movement on their own soil. From a purely operational standpoint, an unconventional warfare campaign would no doubt yield precious tactical dividends by increasing Chinese rear area anxiety and compelling the PLA to tie down large numbers of troops in surveillance and garrison duties. If India’s goal in the event of conflict, however, is to rapidly conclude hostilities on favorable terms, such a move could prove counter-productive, as it would inevitably lead to protraction along with widespread suffering among the Tibetan people thus impeding war termination. In effect, the wisest posture might be to maintain such a capability as a form of deterrent and as part of a broader competitive strategy, and to only resort to special warfare in the event of significant escalation on the part of China. Iskander Rehman is a Senior Fellow at the Pell Center for International Relations and Public Policy at Salve Regina University. Ryan Boone at the Center for Strategic and Budgetary Assessments kindly assisted in the production of the graphics. Iskander can be followed on twitter @IskanderRehman.